We all get stuck, especially when we are thinking about making a big change in our lives like working for ourselves. 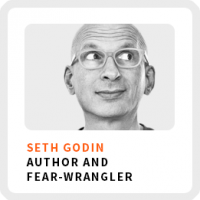 I couldn’t be more excited to share my interview with Seth Godin! He has been an enormous influence on my life and thinking, as I know he has been for legions of others. I believe no one has ever written more clearly and frankly about the future of work than Seth. If you’ve never read one of his books, they are pretty life changing. They’ll forever alter your perspective in so many large and subtle ways. Personally, I recommend starting with Linchpin to understand why working with purpose is now an imperative. Then read Tribes. If you want to make a big change in your life, you can’t go it alone. You need to find your tribe. Dance with your fears. Seth shares what he learned from receiving 850 rejection letters after publishing his first book. Why creating your own work is your best option in the 21st-century economy. Overcoming resistance. How Seth overcomes “the resistance” and deals with his own lizard brain. I’m also excited to give away 10 copies of Seth’s latest book, What to Do When It’s Your Turn. Read below to find out how you can snag your very own copy! Wake up time: Between 4am and 6am. Definition of Success: Combination of making someone’s world better and having freedom to make his own choices. Purpose of his work: Turn on lights and help people see things that were there all along. Self-reflection practice: He says he really doesn’t have one. He believes if he self-reflects too much his fears will take over. 90-day goal: Says he hasn’t had business goals in a very long time because they didn’t make him happy and they didn’t make his work better. Recast your idea into the smallest possible version for the smallest possible audience that would be worth doing. Learn from your first iteration and build on it if you can. Thinking of biggest possible idea for the biggest possible audience will only get you stuck. I’m giving away 10 free copies of Seth’s latest book, What to Do When It’s Your Turn. I’ll be choosing 10 people at random from my entire email list. If you aren’t already on the LSTM email list, click on the button below!